Leo Rayon is a young saxophonist who has performed with such jazz greats as Jason Moran, Ethan Iverson, Woody Witt, Ben Allison, Brandon Lee, Gerald Clayton, Myron Walden, Mark Shim, Kirk Whalum, Billy Hart, Carol Morgan, Doc Morgan, and Horace Alexander Young. Upon graduating from the renowned High School for the Performing Arts, he attended the University of New Orleans, where he studied with Ed Peterson and was a member of one of the city's most in-demand bands, Delfeayo Marsalis’ Uptown Jazz Orchestra. He transferred to Texas Southern University and graduated with honors from TSU with honors in 2016. 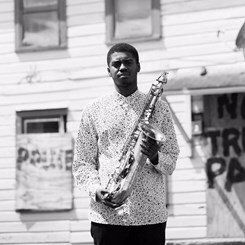 Rayon is currently a graduate assistant for Jazz Studies at the University of Maryland, where he currently studies with Chris Vadala. Request Lessons with Leo Rayon today!